This past weekend I went down to Maryland with a few friends of mine to take advantage of Blue Crab and Soft-shelled Crab season. While the focus of the trip was on eating an unhealthy volume of shellfish, we happened to pass a coffee shop, and were so interested we ended up going back to see what it was about. 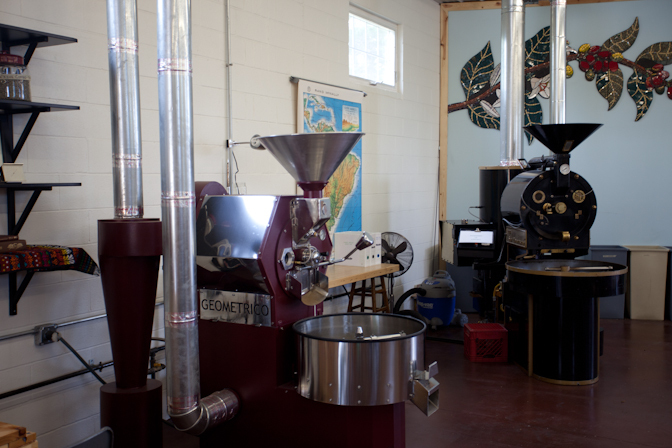 I was surprised to find only organic coffees, on-site roasting and a pour-over bar. The shop is Rise Up Coffee, and they do in house, small batch roasting of organic single-origin coffees. I went on a Sunday, so they hadn't roasted in a bit, but I was able to purchase a 1lb of Indonesia Single Origin for $15, and they were happy to brew me a cup in a Pour-over. The beans were a little bit old at that point (07.06.12) roast date, so some of the brighter notes were gone, but all in all it was a decent in unremarkable cup. My friend got one of their blends and I have to say that it was significantly better. It had a rather strange flavor profile with a good bit of acidity up front and an abruptly clean aftertaste. It was a very interesting, if not terribly balanced cup. I have some photos below for your viewing pleasure. I would recommend this place to anybody who was heading down to the Chesapeake to ingest unhealthy quantities of shellfish. To be honest, I don't think this would be my favorite cafe if it were in Brooklyn. The beans were a bit old and the selection small at that time. But at the same time, it doesn't really have a fair view of the place. I tend not to like Indonesians, so it shouldn't really be surprising that I didn't like this one. Their brew technique was quite good though, their branding was slicky and I think, pretty cool (even if it does look a bit like Irving Farms), the staff kind. I like being able to brew a batch and I support local roasting efforts. To be honest, little places like this are spreading the good word and even if they don't have the infrastructure of say Stumptown to go and work directly with farmers, by having a good quality roast and single-origin beans, they are already expanding good coffee into places where you wouldn't expect it.